Mohandas Gandhi was the twentieth century’s most famous advocate of nonviolent politics. But was he also its most spectacular political failure? The possibility is usually overshadowed by his immense and immensely elastic appeal. Even Glenn Beck recently claimed to be a follower, and Gandhi’s example has inspired many globally revered figures, such as Martin Luther King, Jr., Nelson Mandela, the Dalai Lama, and Aung San Suu Kyi. Gandhi, rather than Mark Zuckerberg, may have been the presiding deity of the Arab Spring, his techniques of resistance—nonviolent mass demonstrations orchestrated in the full glare of the world’s media—fully absorbed by the demonstrators who prayed unflinchingly on Kasr al-Nil, in Cairo, as they were assaulted by Hosni Mubarak’s water cannons. How can one square such quasi-Shakespearean tragedy with Gandhi’s enduring influence over a wide range of political and social movements? Why does his example continue to accumulate moral power? There are some bracing answers in “The Cambridge Companion to Gandhi,” edited by Judith M. Brown and Anthony Parel, a new collection of scholarly articles, examining particular aspects of Gandhi’s life, ideas, and legacy (Cambridge; $90). Still, Lelyveld relates the more compelling story of how a supremely well-intentioned man struggled, through five decades of activism, with a series of evasions, compromises, setbacks, and defeats. As a young man in South Africa at the beginning of the twentieth century, Gandhi developed satyagraha, a mode of political activism based upon moral persuasion, while mobilizing South Africa’s small Indian minority against racial discrimination. But the hierarchies of South Africa did not start to be dismantled until nearly a century later. After his return to India, in 1915, Gandhi sought to fight the social evil of untouchability in India, but Lelyveld shows that his attempts were of mostly symbolic import and were rebuffed even by the low-caste Hindus who were the presumed beneficiaries. Gandhi’s advocacy of small-scale village industry and environmentally sustainable life styles was disregarded by his own disciple and political heir, Jawaharlal Nehru, who, as Prime Minister, made India conform to a conventional pattern of nation-building: rapid industrialization and urbanization, the prelude to India’s ongoing, wholly un-Gandhian, and unsustainable attempt to transform 1.2 billion people into Western-style consumers. Lelyveld also shatters the attractive myth, burnished by Richard Attenborough’s bio-pic, of the brave little man in a loincloth bringing down a mighty empire. As early as the mid-nineteen-thirties, Gandhi had largely retired from politics, formally resigning from the Congress Party to devote himself to the social and spiritual renewal of India’s villages. And by the time independence came, the British, exhausted by the Second World War, were desperate to get rid of their Indian possessions. Their hasty retreat led to one of the twentieth century’s greatest fiascoes: the partition of British India, in August, 1947, into Hindu- and Muslim-majority states. The accompanying fratricide—it involved the murder and uprooting of millions of Hindus and Muslims—condemned India and Pakistan to several destructive wars and a debilitating arms race. It was the cruellest blow to Gandhi. Liberation from colonial rule meant little to him if the liberated peoples did not embody a higher morality of justice and compassion. Appropriately, Gandhi’s last major act was a hunger strike protesting the Indian government’s attempt to deny Pakistan its due share of resources. By then, as Lelyveld writes, he was longing for death. Having refused all police protection, he was shot dead in January, 1948, by a Hindu patriot who feared that Gandhi’s faith in such irrational things as individual conscience would prevent independent India from pursuing its national interest with full military vigor. Gandhi’s ideas were rooted in a wide experience of a freshly globalized world. Born in 1869 in a backwater Indian town, he came of age on a continent pathetically subject to the West, intellectually as well as materially. Europeans backed by garrisons and gunboats were free to transport millions of Asian laborers to far-off colonies (Indians to South Africa, Chinese to the Caribbean), to exact raw materials and commodities from Asian economies, and to flood local markets with their manufactured products. Europeans, convinced of their moral superiority, also sought to impose profound social and cultural reforms upon Asia. Even a liberal figure like John Stuart Mill assumed that Indians had to first grow up under British tutelage before they could absorb the good things—democracy, economic freedom, science—that the West had to offer. The result was widespread displacement: many Asians in their immemorial villages and market towns were forced to abandon a life defined by religion, family, and tradition amid rumors of powerful white men fervently reshaping the world, by means of compact and cohesive nation-states, the profit motive, and superior weaponry. Dignity, even survival, for many uprooted Asians seemed to lie in careful imitation of their Western conquerors. 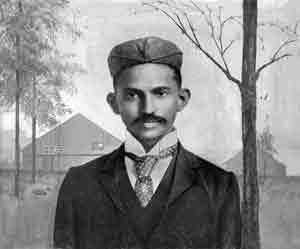 Gandhi, brought out of his semirural setting and given a Western-style education, initially attempted to become more English than the English. He studied law in London and, on his return to India, in 1891, tried to set up first as a lawyer, then as a schoolteacher. But a series of racial humiliations during the following decade awakened him to his real position in the world. Moving to South Africa in 1893 to work for an Indian trading firm, he was exposed to the dramatic transformation wrought by the tools of Western modernity: printing presses, steamships, railways, and machine guns. In Africa and Asia, a large part of the world’s population was being incorporated into, and made subject to the demands of, the international capitalist economy. Gandhi keenly registered the moral and psychological effects of this worldwide destruction of old ways and life styles and the ascendancy of Western cultural, political, and economic norms.